Just a week after her recent trip to East Angola, Icel Rodriguez saw results from that visit – a visa granted to an East Angolan to visit the Florida Conference. The Florida Conference will welcome 21-year-old Jorge Mucuta of East Angola when he visits in March 2012. 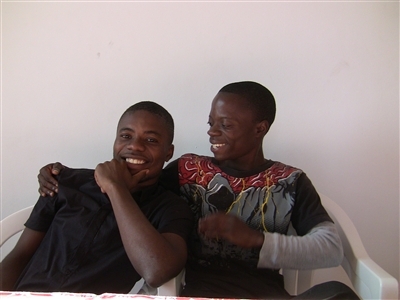 The visit by 21-year-old Jorge Mucuta, who resides in and helps manage the United Methodist boarding house and orphanage in Quessua, East Angola, will occur March 1-29, 2012. The East Angola/Florida Partnership provides funds and sends mission teams that help support the boarding house operations. Mucuta obtained U.S. approval to travel to Florida on a non-immigrant visa, according to Rodriguez, Florida Conference Global Mission Director. During her June visit to East Angola, Rodriguez used her knowledge of the visa process to assist Mucuta with his application. She and her husband, the Rev. Dr. Armando Rodriguez, served as Florida Conference missionaries to the East Angolan Conference for one year, returning in July 2010. While in the United States, Mucuta will visit local churches and youth and young adult groups across the Florida Conference to talk about the life and ministry of the East Angola Conference. Anyone interested in hosting him, should contact Rodriguez at irodriguez@flumc.org. Mucuta, who will graduate from the United Methodist Quessua High School in December, oversees the boarding house finances along with another young adult, Rodriguez said. Rodriguez and her husband trained the young men in responsible accounting practices during their year in East Angola. The two young men follow the financial procedures thoroughly, Rodriguez said. Also, they have been sharing their knowledge with the students who will take over those roles. “They really are doing a remarkable job,” she said. Rodriguez also delivered $10,000 to them to assist with needs of the boarding house feeding center. Many of the 45 boys living at the boarding house, who range in age from 12 to 21 years, would be without education, housing and meals otherwise. 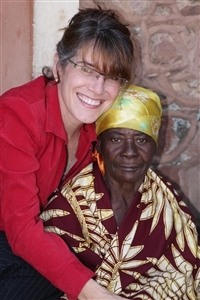 Global mission director Icel Rodriguez hugs a member of Quessua United Methodist Church during her June 2011 visit to East Angola. Additionally, Rodriguez presented an invitation on behalf of the Wisconsin Conference to Anna Ingles, the chairwoman of the United Methodist Women in the East Angola Conference. If Ingles receives her visa, she will visit the Wisconsin Conference in October. Rodriguez hopes to host Ingles in the Florida Conference too. The Wisconsin and Yellowstone Conferences also partner with East Angola and coordinate efforts with the Florida Conference to avoid overlapping resources, Rodriguez said. Wisconsin is helping expand a library started by the Rodriguez family at the Hope of Africa elementary and middle school in East Angola, and the Yellowstone Conference is providing a salary supplement for East Angolan pastors. While in Angola, Rodriguez also met with East Angola Bishop José Quipungo to secure his help on visa approval for a missionary couple from Cuba to serve in East Angola, Rodriguez said. The couple already has approval from the Cuban government. Once granted Angolan visa approval, missionaries Leonardo Garcia and Cleivys Benitez will be appointed to serve in the Quessua Mission for two years. Their responsibilities will include assisting the children and youth who live in the boarding house, teaching as faculty at the School of Theology and coordinating volunteer teams from Florida. Funds from the East Angola/Florida Partnership will support them. “They are just wonderful people and they are just deeply, deeply Christian, educated people,” Rodriguez said. In e-mailed correspondence with the Florida Conference Connection, the couple said they were called to missionary service early in their lives. “Today we know that since then, God was preparing us to serve as missionaries in our beloved Angola,” they said. “Without a doubt, what we are most passionate about is to share the love of God with the people of Angola. Garcia and Benitez have been preparing for their appointment with “constant prayer so that God will remove all the barriers that are still hindering our arrival at Quessua,” they said. They also have been working on the classes that they will teach at the seminary, and studying the language, culture and history of Angola. The boarding house students are excited about the couple’s appointment, Rodriguez said, recalling their prayers. “We went up the mountain and at the top of the mountain, there’s a cross…and it was so, so moving to hear the kids’ prayers for visas for these two,” she said. Funds for the couple’s travel and first three months salary are already available, according to Rodriguez. Members of the Florida Conference can support the couple’s mission through prayer, financial assistance and team visits. Checks can be made payable to “Florida Conference Treasurer,” with Advance #100130 in the memo line. In keeping with the East Angola/Florida partnership’s emphasis on education, Rodriguez also spent part of this recent trip visiting directors and administrators of educational institutions in East Angola, and checking on their financial statuses. These institutions included the School of Theology and high school in Quessua, as well as the Hope of Africa elementary and middle school in the nearby city of Malange, where the East Angola Conference center is located. Hope of Africa is a United Methodist school with students ranging in age from kindergarten through ninth grade. The school has 24 teachers with 850 students. Some of the students who live in the Quessua boarding house walk about six hours per day to attend Hope of Africa for middle school, Rodriguez said. Bus transportation is not available at this time, but is a future possibility. “The kids cannot continue walking that many hours a day,” she said. Leaders of the Quessua High School and Hope of Africa might rent a bus that would transport students from Quessua to Malange and teachers from Malange to Quessua. The Florida Conference would assist by providing $3,300 per year to cover the rental. 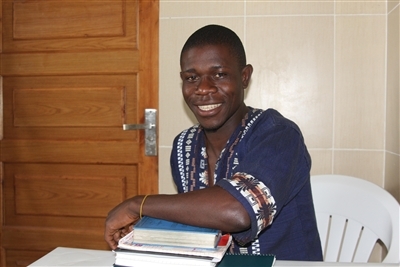 Rodriguez also helped three students from the boarding house who graduated in December make the transition to Africa University to pursue bachelor’s degrees. The United Methodist Church opened and continues to support Africa University, located in Zimbabwe. The East Angola/Florida Partnership will provide full scholarships for these two young adults--Chicosseno Salvador and Pedro DaSilva Gomes--to attend Africa University. They are graduates of Quessua High School. The students needed assistance with their paperwork, funds and communication with Africa University, Rodriguez said. The East Angola/Florida Partnership will pay for the students’ tuition, accommodations, meals, immigration permits, and travel to the university, which is expected to cost about $8,000 per student annually. When Icel and Armando were preparing to return to the United States last summer, they did so with concern for the welfare of these and other students. But the students told them that their priorities rested with learning. People who wish to support the East Angola/Florida Partnership with financial gifts may do so with Advance #100090.